From Google (people looking for howtos). From planet fedora as my blog is listed there. Because of the improvements in page rank. Because of my recent plugin development for squid, i.e. youtube_cache and intelligentmirror. Because of the aging factor. Anyway I thought I’ll publish some results. I have been receiving 800 Pageviews daily on an average. 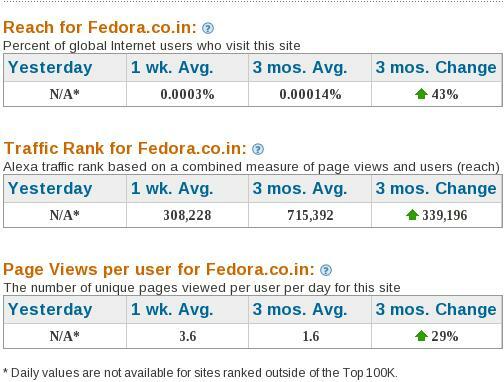 Alexa says my blog’s rank in 3 lakh. Click for a clear view. 2. Alexa traffic stats for the last week , also available here in detail. 3. I recently activated the who is online plugin on Linux blog which shows how many users are currently online. Normally 5-15 users are online but I was surprised when it reached 38 users. 4. This site says that my blog is worth US$4300.